I don't have access to my proper AppleTV remote to control my AppleTV (4th Gen), but that's no problem because I can use the Remote app on an iPhone and iPad. The Remote app was working fine until one morning it wouldn't connect from any iPhone or iPad. The status listed is "offline" -- see the attached screenshot. 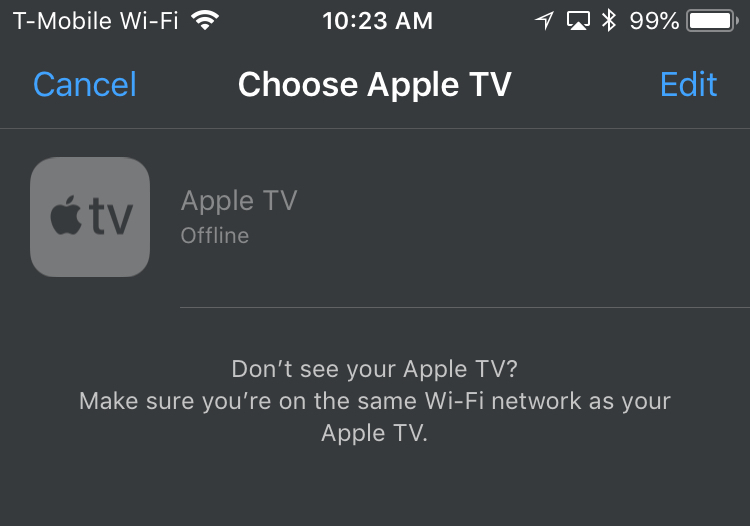 The AppleTV appears to be still connected to the WiFi network, as I am able to share my iPhone's screen. How would screen sharing work but the Remote not work? I killed the Remote app multiple times (swipe up) and rebooted the AppleTV (power cycle). Screen sharing and AirPlay can work over Bluetooth -- WiFi is not necessary. On the other hand the Remote app requires that the AppleTV is connected to WiFi. This explained my problem. My AppleTV was connected to a 2.4 GHz WiFi network, which stopped working. For some reason the 5 GHz network continued to work and my iPhone switched over, so I didn't notice. Find a regular TV remote (with directional pad buttons). Plug the ethernet cable to the Apple TV. Select Learn Remote and follow the steps to teach AppleTV your TV remote. Once done, unplug the ethernet cable and set the WiFi under General -> Network -> WiFi. Not the answer you're looking for? Browse other questions tagged appletv screen-sharing remote.app .